You can call it "the Brexit tax." 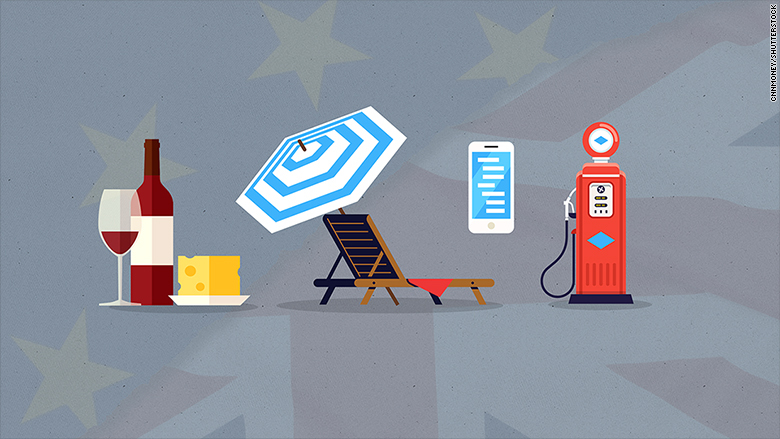 U.K. shoppers are paying more for wine, food, gadgets and vacations thanks to a huge slump in the value of the pound brought on by Britain's vote to leave the European Union. The currency has lost 18% against the U.S. dollar and 15% against the euro in less than four months. Its slide is putting pressure on companies that sell products in Britain but count their profit in other currencies. 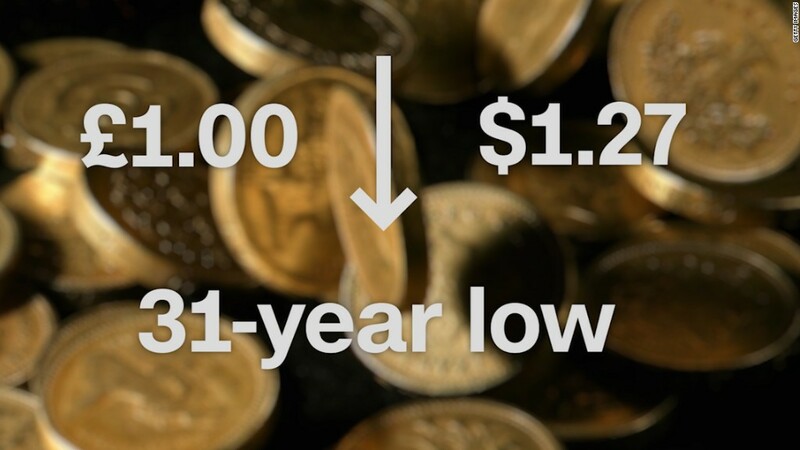 The pounds they earn are suddenly worth much less than before. Many have no choice but to hike prices. "As the pound devalues -- which many consumers might see as a rather abstract idea and only of interest to bankers -- we will eventually be hit in our wallets, when we buy from multinational firms," said Nick Lee, a professor at Warwick Business School. The U.K. has a real craving for imported foods -- from French wine to American ice cream. Enotria & Coe, one of the U.K.'s biggest wine importers, hiked prices this month because of the slumping pound. There was more bad news for consumers on Thursday, when supermarket giant Tesco pulled Ben & Jerry's ice cream and Marmite spread from its online store. Why? Because of a dispute over who should bear the burden of the weaker currency -- Tesco's supplier or its shoppers. Capital Economics says it could take up to a year for the full effect of the currency's decline to hit prices and wages. Global tech companies rely on components priced in dollars, and that means they need to charge higher prices in the U.K. to offset the pound's decline. When Apple released its new iPhone 7 in September, the smartphone was priced 11% higher than the iPhone 6S. Meanwhile, the two phones were being sold for the same price in the U.S.
HP and Dell both announced price hikes over the summer. Chinese smartphone maker OnePlus also hiked the price of its OnePlus3 model by 6.5%. Brits love to vacation in France and Spain. But there's no escaping the pound. Foreign exchange firm FairFX estimates that a two week family holiday in France is 12.7% more expensive than before the vote. That's a difference of 390 pounds ($475). Fuel prices are sensitive to currency moves because oil is priced in dollars. So far, only a small share of the burden has been passed to motorists. The average price of gasoline -- that's petrol to Brits -- has crept up one pence to 1.12 pounds a liter, according to government data. But experts say more increases are coming. "The double impact of the pound weakening against the dollar and global oil prices strengthening will cause pump prices to move sharply upwards," said Brian Madderson, chairman of the Petrol Retailers Association.